Two decades after its debut and 15 years since it was last a standalone set, Select is back on the diamond. 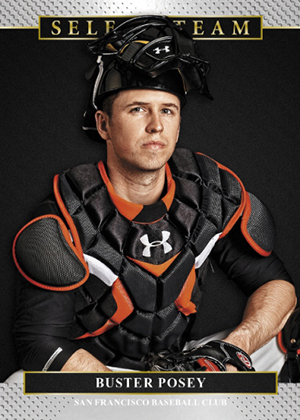 2013 Select Baseball marks the return of another brand made famous in the 1990s. Originally made by Pinnacle, Select last appeared as a baseball set of its own in 1998. A couple of inserts bearing the name popped up, but not a full on release. Until now. 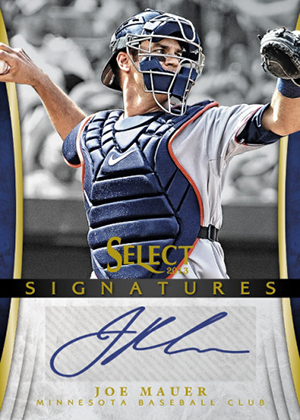 Taking a page from Panini's other resurrected sets, 2013 Select Baseball is higher-end spin that includes lots of autographs and Prizms. Every box is packaged as a pair of seven-pack mini boxes. Master boxes include four autographs, five Prizm parallels and several inserts. The base set consists of veteran players, but rookies and retired greats are also present, albeit as short prints. Master boxes have a pair of each. The rookie checklist has 50 players, including Yasiel Puig. Parallels include Prizm (#/99), Gold Prizm (#/25) and Black Prizm (1/1). A total of 75 players are on the Rookie Autographs checklist. 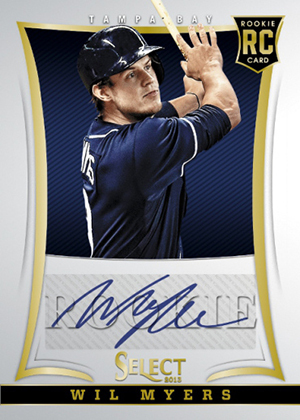 Signers include standouts like Wil Myers, Shelby Miller, Jurickson Profar and Gerrit Cole. Basic versions are numbered to either 500 or 750. Prizm parallels are numbered to 99 and Gold Prizms are limited to 25. Veterans and retired players lend some ink in Signatures. The 100-card checklist has such names as Ken Griffey Jr, Roger Clemens, Stephen Strasburg, Joe Mauer, Yoenis Cespedes, Cal Ripken and Rickey Henderson. Members of the 2013 MLB Draft star in the 15-card Select Future (1:7 packs). Mark Appel, Kris Bryant and Jonathan Gray are among those in the set. 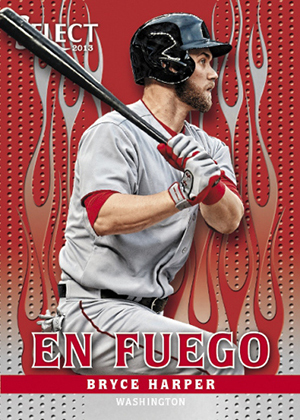 En Fuego, one of Select's trademark inserts, returns in 2013 Select Baseball. While these used to be done on foil-like Dufex, they're getting a Prizm makeover. Inserted one per mini box, the fiery set focuses on top stars. 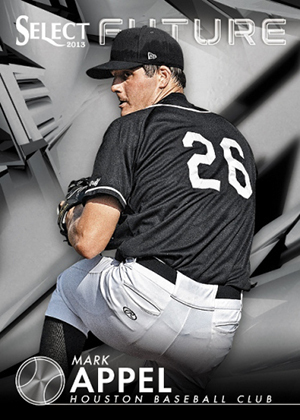 Other inserts in 2013 Select Baseball include Select Skills (1:7 packs), Thunder Alley (1:7 packs) and Select Team. I really like this product, and as it’s release date gets further in the rear view, singles are getting harder and harder to come by. As a set builder, it has provided an excellent challenge, and as an aesthetic collector, there is plenty to be had here. The base set is simple, but looks great. While centering can sometimes be an issue, it’s a clean looking set, on quality stock that lends itself well to grading. The Rookies are tough to pull, and a base set can prove difficult to put together. I am still working on mine. The value that the top rookies command is often right at or near FULL book value, still. The set is also chock full of HOFers and other retired favorites, with everyone from Ripken to Nolan, Ernie Banks to Darryl Strawberry. The Prizms, refractor-y type cards, are beautiful, especially the insert sets, namely Thunder Alley and En Fuego. The Gold Prizms are even nicer, and /25. There are also a ton of autos, and some rare or tough ones. Yes, it’s Panini, so no logos and team names. This is definitely a bummer, but they are getting better at choosing action shots and zooming in so that it seems less of an issue. I hate sticker autos. Hate. But this isn’t just a Panini issue. Everyone is using them unless it’s a high end product, and even in those sometimes. Alas, every auto you pull from Select will be sticker, not on card.